The fashion industry is a powerful communicator of ideas about beauty and body image, particularly to women and All Walks is an initiative founded in May 2009 to facilitate a conversation around these issues. All Walks Beyond the Catwalk collaborates with a new generation of emerging ready-to-wear designers and a diverse range of professional models to challenge some of the industry’s long-held ideas about female size, shape and age. Endorsed by the British Fashion Council – and supported by the London Development Agency – All Walks worked closely with the charity BEAT in its inaugural season. 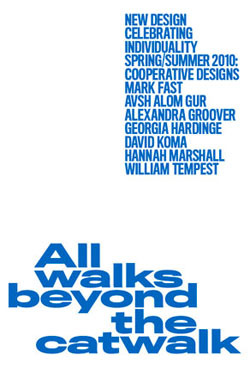 SAM WILSON AT SIX CREATIVE & FOUNDER DEBRA BOURNE CREATED THE ALL WALKS BEYOND THE CATWALK BROCHURE. Click image to download art house brochure.